Tomorrow, California's foie gras ban begins. This is sad for so many delicious reasons, but I really liked Diana's take on the ban. You should read it. Yesterday, insomniac and I panicked. We'd forgotten. We'd procrastinated. We scrambled. Luckily, insomniac booked an early reservation for us at Petrossian, where I had the most gorgeous meal with dapotato and Winnie nearly two years ago. Dining with insomniac is a joy. She loves food as much as I do. She makes me laugh. She holds menus for me. When we eat, we do it right. She gets it. There was no better companion for this meal. We barely made it, people. Barely. I can't tell you how fortunate we were to experience this meal together -- five glorious courses, each better than the former. 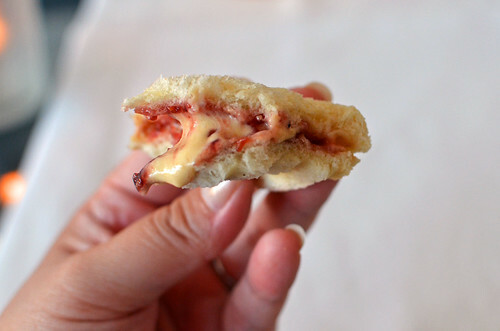 Every single bite was happiness laced with sorrow. 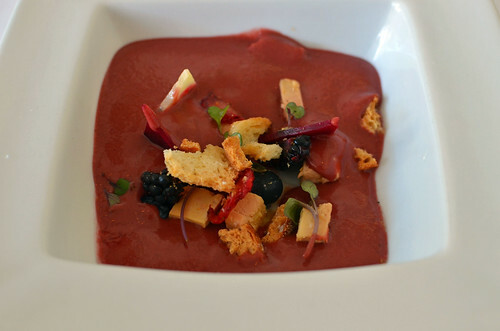 Summer berry gazpacho, Armagnac poached foie gras, pickled beets. 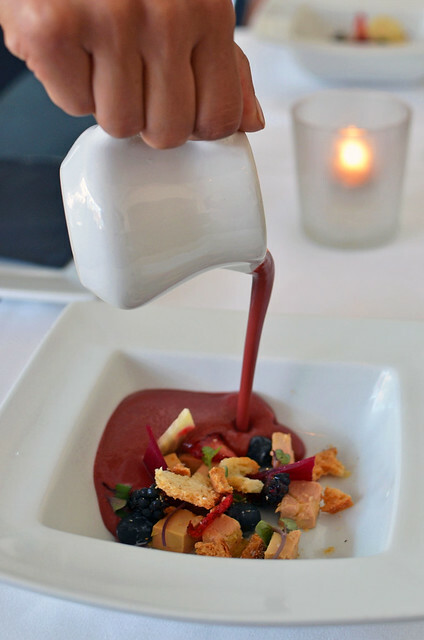 insomniac ate my blackberries for me because I am allergic, but, even without the blackberries, this was a burst of fruity sunshine punctuated with rich, creamy cubes of foie. So bright! So fun! 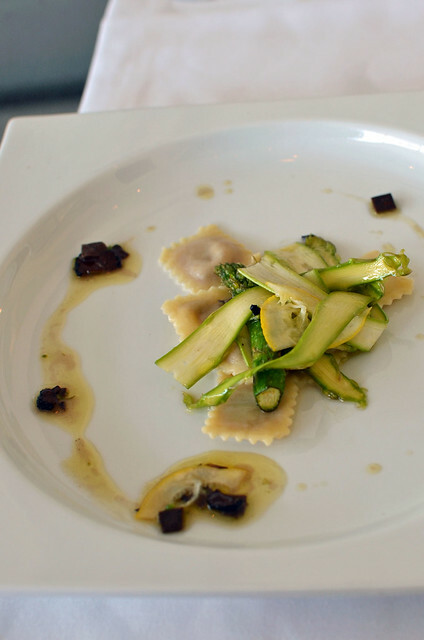 Asparagus salad, black summer truffles, little gem baby lettuce, truffle jus vinaigrette, foie gras ravioli. The pasta was impeccably al dente and delicately stuffed with our beloved star ingredient. I swirled the ravioli all over the plate to soak up the wondrous truffle jus. Each mouthful was an incredible explosion of truffles and luscious foie. And then we got really excited. It was time for our usual favorite preparation -- the sear! Is this girl thrilled with the arrival of this plate or what? 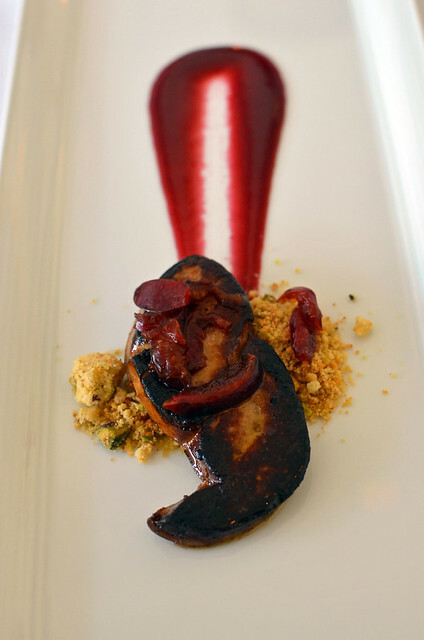 Seared foie gras, cherries, mint, pistachios. Oh, the sear. The sear! Exceptional. The tangy. The sweet. The nutty. All perfect accompanying flavors for this stunning piece of shiny, fatty foie. 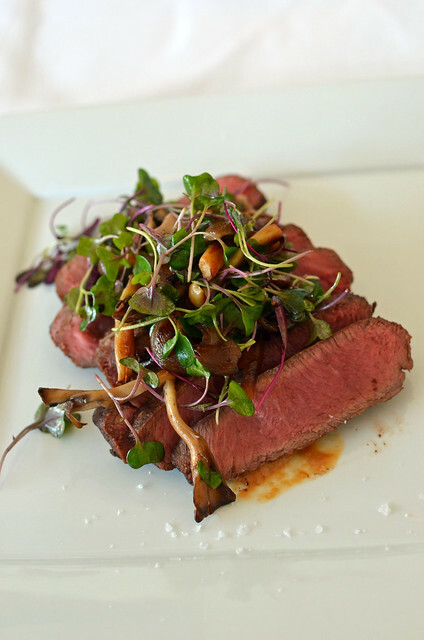 Prime flat iron, foie gras, onion, fines herbes, Fresno chili. To say this portion of steak was generous is an understatement. We both ate half and boxed up the rest to take home. It was tender. It was meaty. It was sitting on top of a splendid pool of foie gras sauce. Yeah! Foie gras ice cream, brioche, raspberry jam, sea salt, honey. Neither insomniac nor I have a sweet tooth. If, given the choice, we'd both pick savory over sweet any day. But this dessert was extraordinary. 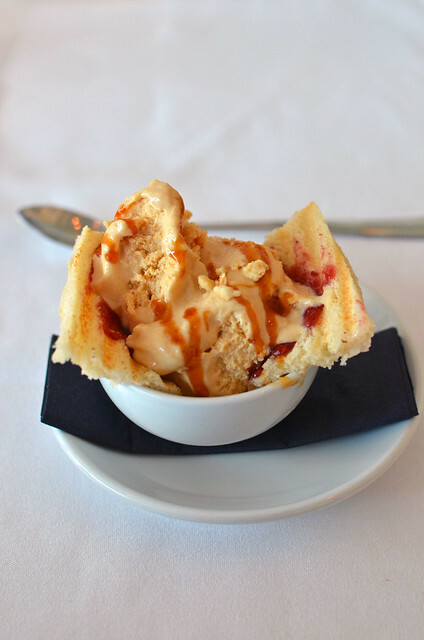 Imagine the best peanut butter and jelly sandwich in the whole universe, except instead of peanut butter and white bread, you have the most decadent and incredible foie gras ice cream hugged by fresh, fluffy brioche. Now multiply that bliss by 100. This did us in. It was so good that it made insomniac weep. No joke. 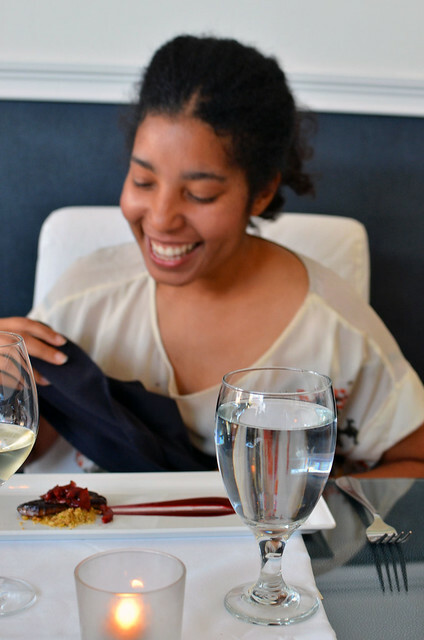 With reactions like this, it's obvious why I love this girl to pieces and why she was the perfect person to help me bid farewell to foie gras in California. They banned foie gras and made us hustle to eat a lot. I just can't stop laughing at M crying. Signed, Not-a-FG-Lover. It wasn't funny! It was sad! Thanks! And thank you so much for being one of my best commenters! 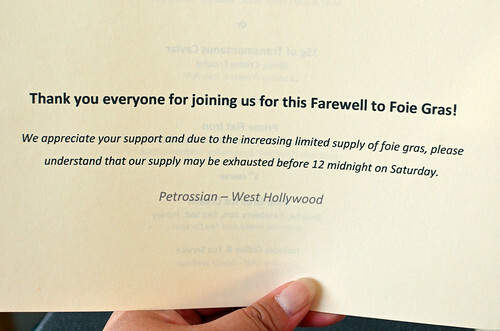 Ok now I regret not going to a farewell to foie dinner. Foiiiiick! 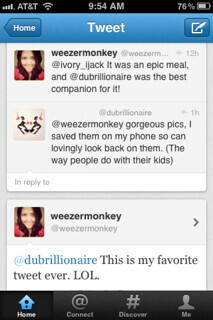 ;) Thanks for the shout out... and WELCOME BACK! Love you, D! We should eat! This sounds like a very fitting farewell! 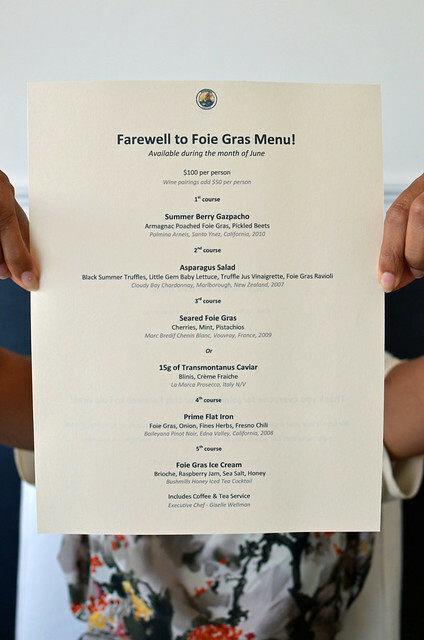 I have to admit I don't like foie (someone is probably coming to revoke my foodie credentials as I type), but I'm glad you sent it off in style. You were such an awesome date. I bet a certain GG would be a totally lousy date. Looks like the perfect farewell to foie gras with the perfect person! what winnie said. and love the light for the photos! I was so lucky for so many reasons, including great light! LOL I die. 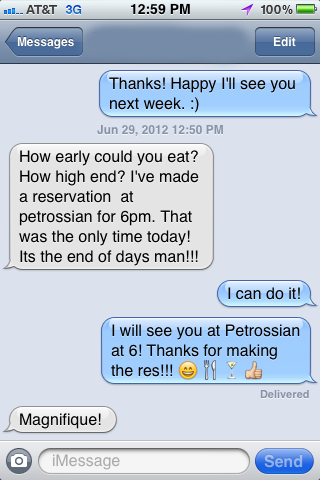 I wish I had known that the stupid BF would be out till 3am instead of the 8pm or so that he had originally promised, cause then I would have "accidently run into you two" at Petrossian. I wish you'd joined us! Was a wonderful way to say goodbye. Sniffle. "It's the end of days man!!!" LOL. I can totally hear her saying this in my head. Her text was SO FUNNY. She really makes me laugh out loud for real. Another visit to NYC is in order! We will keep you in foie whenever you crave it. We are probably returning in September!!! I loved this entire post. That dessert would make me cry, too.